BA (Hons) Theatre (Performance and Production) is a practical course designed for people who want to create their own original theatre work and develop key technical, digital and management skills to support the creative process in professional contexts. Audition: Candidates will be asked to attend an audition day. You will present two prepared speeches, talk with staff about their interests and ideas for making theatre and take part in a devising workshop. You will get the chance to meet current students over lunch. "Throughout our studies we worked closely with our lecturer Pete Phillips to define our performance and establish our company, which was very beneficial. Rachel and I first met at Chichester four years ago, and have been working together ever since. While we were at Chichester, we formed Cool Hunting, and have gone on to perform at Glasgow's Buzzcut festival, appear at Camden Town's famed People's Theatre, and have been artists-in-residence at Brighton's Marlborough Theatre." In addition to classes in Theatre, leading to a range of diverse performing opportunities, students will develop production skills, choosing from a variety of lighting, sound, digital and design tasks, alongside key experiences in arts management and administration. Students will work closely with students across a range of performing programmes and have significant placement opportunities with a wide range of professional theatres and arts organisations. This is a perfect course for performers who are excited by the whole process of realising a theatre project. This programme embraces the core elements of our Theatre programme – creative processes, performance and critical engagement with contemporary theatre making – and adds key concerns in professional and technical producing. We recognise the increasing demand for independent professional artists to be equipped both in performance and management skills: a flexible and holistic understanding of how theatre is made. At the heart of the learning experience of the Theatre department is a fully equipped 212-seat public theatre venue - The Showroom. 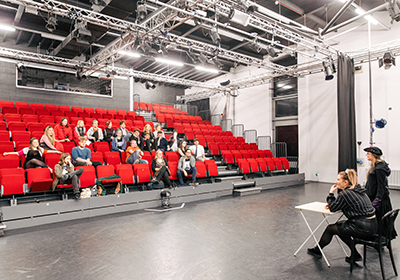 The department uses the Showroom for student performances, practical workshops and hosting some of the best international touring theatre. Find out more about the ShowRoom. At Level Four (first year) students work alongside theatre students in developing performance skills and performing in key projects on Narrative, Visual Theatre, Text/Deconstruction and Cultural Identity; they also develop skills in technical elements to do with performance design: Lighting, Sound and Digital Media and get the chance to control and stage manage key performance events. At Level Five (second year) students progress in their performer-making skills, taking part in a major production with all students from the year and focusing on specific types and contexts of theatre making (Comedy, Schools Theatre, Multi-Media, Site-Specific etc…); they develop management skills in targeted projects and explore key notions of design in relation to independent arts practice. At Level Six (third year) students take part in a range of major performance and directing exercises and develop their knowledge of how theatre is produced and developed in a professional context. Your work is assessed through a wide range of practical/performance contexts: group and individual performances, directing exercises, presentations and creative installations. Some classes are assessed through continuous assessment and through written evaluations, with several formal essays that lead to a final-year dissertation.